The RiverFire 5K attracted many runners and added to the excitement of the day’s activities. Children enjoyed the bouncy houses at the Logging Camp at Heritage Park, pumpkin carving, face painting, the Little Hooves Traveling Petting Zoo, and the farm animals from Simple Wheys Farm. Everyone LOVES a hayride! Antiques tractors continuously traveled from the Heritage Park to the 12th Street Bridge and back with a full load of people! Close to 1,000 rides were given during the event!! The Not So Scary Halloween Party is in its 2nd year and growing! This year, Service Credit Union occupied 2 buildings for the party to do crafts and play Halloween-themed games. DUKE, a country rock band whose members are all from Berlin, drew a large crowd for their coming home debut. 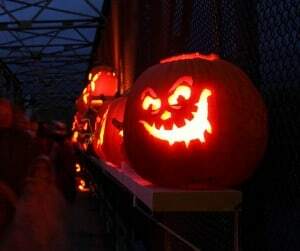 There were more than 400 carved pumpkins on the Androscoggin River Bridge this year — another record breaker! 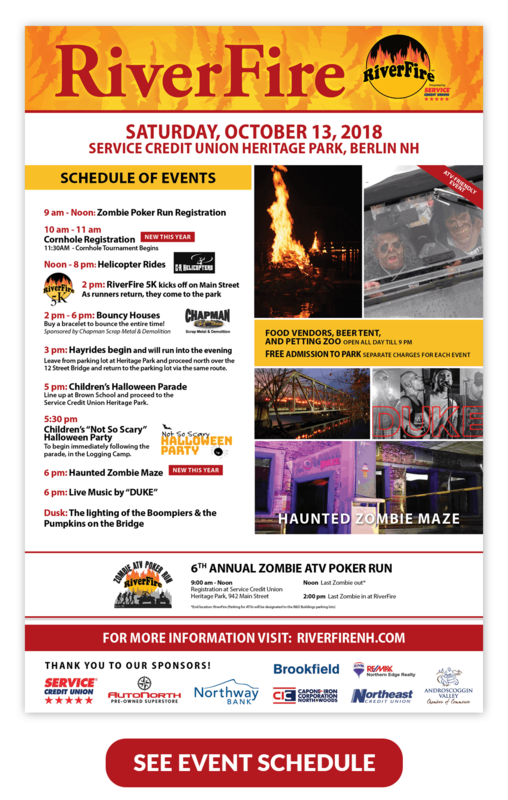 Just as the nights are getting colder in New England, the City of Berlin will be warming things up with one of the best fall festivals around—RiverFire! Come to “the city that trees built” to catch a full day of fun, ending with some dramatic fires on the river. RiverFire burns bigger and brighter every year, and this year there are some fun new activities for everyone. The gates of the Service Credit Union Heritage Park, 942 Main Street, Berlin, NH will open to activities and vendors for visitors of ALL ages. Admission to the park is FREE. Date is October 13, 2018. Run or walk in the RiverFire 5K along the picturesque Androscoggin River. End your race at Berlin’s RiverFire celebration. Click Here for more information and for the ONLINE REGISTRATION! To DOWNLOAD & PRINT REGISTRATION the registration CLICK HERE!. At dusk, the Androscoggin River will be lit up with fires that appear to be floating on the water! The blazes will actually burn on the historic boom piers that dot the river. These piers were used during the height of the logging era, when they separated and guided the many trees that were sent down the river to the mills of Berlin. For RiverFire, these old piers will be stacked with skids, which when set aflame create a dynamic contrast of light over the dark waters. Take a walk along the bridge and admire the wonderful glowing carved pumpkins on the bridge. RiverFire is the hottest event of the season. It is a spectacle you won’t want to miss! For more information, call 603-752-6060 or find RiverFire Berlin, NH on Facebook. Thousands of people enjoyed RiverFire 2017 on a brisk Fall day! More pictures on Facebook!